Indulge in the elegant beauty of Chocolate by Petite Le Vian. 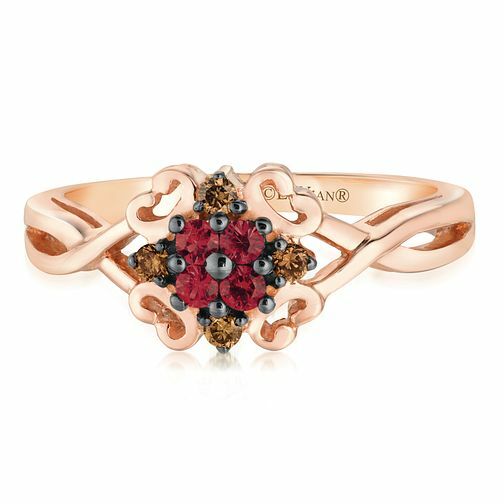 Crafted from sumptuous 14ct Strawberry Gold with crossover shoulders leading to an intricate setting, this stunning ring has a square cluster of romantic Passion Ruby stones framed by deliciously dazzling Chocolate Diamonds for breathtaking beauty and unique, glamorous style. 14ct Strawberry Gold Passion Ruby & Chocolate Diamond Ring is rated 3.7 out of 5 by 3. Rated 5 out of 5 by Anonymous from beautiful ring This ring was my anniversary gift. The cluster of chocolate diamonds and ruby look great in natural light as well as artificial light.